The summer NAMM show is a musical instrument extravaganza, a gathering of the industry’s top dealers who introduce their new products and organize star-studded events and concerts for the public to enjoy. For the first time in years, we’ll be heading to Nashville to showcase some of the exciting things we’ve been working on. Stop by Booth #1122 to demo new Ernie Ball products, like our upcoming Expression Series Effects Pedals. You can also play Ernie Ball Music Man instruments, like the award-winning Valentine guitar, the innovative St. Vincent signature guitar, and the new powerful Cutlass and Caprice passive basses. 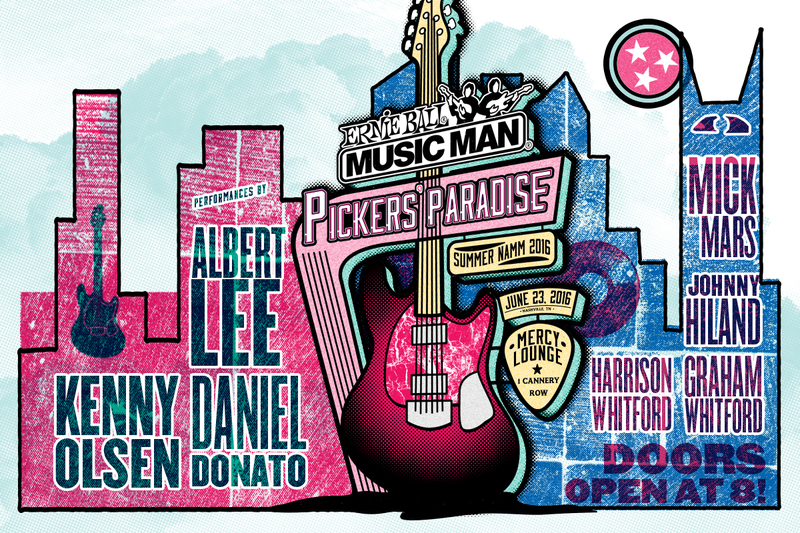 The highlight of the week will be the Ernie Ball Music Man Pickers’ Paradise party, which is open to the public! On June 23rd, come to the Mercy Lounge on Cannery Row at 8PM to see performances by Albert Lee, Daniel Donato, Kenny Olsen, Zane Carney, and more. Learn more about the summer NAMM show and find a booth map so you know where you’re headed. Hope to see you there!